While most of our game purchases are based on gameplay and a certain degree of expected complexity and challenge, other purchases are driven my aesthetics and other less "competitive" aspects of gaming. And thus we end up with nicely fun experiences like this little game. Mythe is a pretty, adorable little game with a tricky card mechanic driving it. It's nicely compact and travels decently well but I wouldn not classify it as a traveling game per se. It's technically a board game but it does have a board crammed into a little box and it's one of the most beautiful boards I've seen in a while. The game is deceptively simple and the trickiness of managing the flow of cards and getting to the final objective is where a lot of the fun is. It's a fairly short game (depending on your players of course) but it's good fun for all ages. Plus the mini-scale that the game was built around makes for an aesthetically pleasing experience even if it's not always a practical one. Mythe is a card-driven board game designed by Koji Malta. The game supports 2-5 players, which is rather surprising for a game its size. 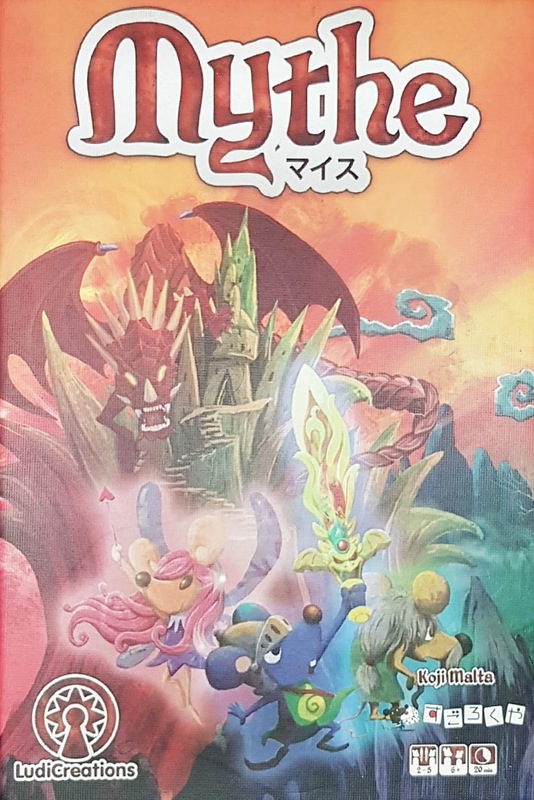 The game has players portraying mice knights on quest to find the golden Sacred Cheese that had been stolen by the evil red dragon. To do this they must travel the pop-up board to get to past the dragon to secure the cheese. This is done by trying to secure movement cards by drawing them from other players and moving accordingly. This works through the fact that the limited deck of cards is divided among all the players. This will consist of cards that give 1-3 movement along with special artifacts that you'll need to fight the dragon. The cards in your own hand won't help your movement as you will only play cards that you draw from other players. This also includes the risk of traps that will void all other movement cards for the turn and prevent you from progressing. Then all cards are redistributed to ensure that no player is left without at least 1 card. What I Liked: The card drafting and bluffing mechanic that limits movement is very clever and defines most of the fun of the game. In the early phase you want all the good movement cards to be seeded in other players' hands so you can draw them for your own benefit. But the highest movement cards tend to be the artifacts like the sword or the fairy and you will need one of them in your hand on the turn you opt to face the dragon. This shift from leaving good cards with others to later needing the card with you for the end game is a nice turnaround. The game in itself is adorable with the bonus detail of making the interior board a pop-up structure. Sure, the volcano in the middle serves no functional purpose other than a cute bit of aesthetics but it's that sort of attention to detail that helps keeps things interesting. They also could have opted to use art to depict the dragon and the cheese as they do pretty much nothing until the very end of the game. But deciding to create pieces for both the dragon and the golden cheese help make things a bit more delightful. What Could Have Been Better: The game starts steadily enough as players initially need to get a grasp of where the different cards are. But the mid to late game take a while to get past as players often get bogged down trying to find the movement cards given all the different traps seeded around the hands. In most games we've played you normally end up with almost all the players lined up at the end of the board as they try to figure out who has the special artifacts and how to still generate enough movement to get past the dragon. I also kind of wish that the board in itself had a few more actions or triggers upon landing or maybe even 1-2 more card types thrown into the mix of things. The game's balance is focused enough on keeping things moving but the slower end game and lack of more actions can make it feel a little slow at times. And so the push to the end can feel a little exasperating as the cards you need keep moving around. TL;DR: Mythe is a good bridge game that you can play as a warm-up game or between other more complex game sessions. It's very, very cute and worth showing off whether or not everyone gets a chance to save the cheese. Thus the game gets a good 3.5 heroic mice out of a possible 5.